TYSONS CORNER, Va.--(BUSINESS WIRE)--Mar. 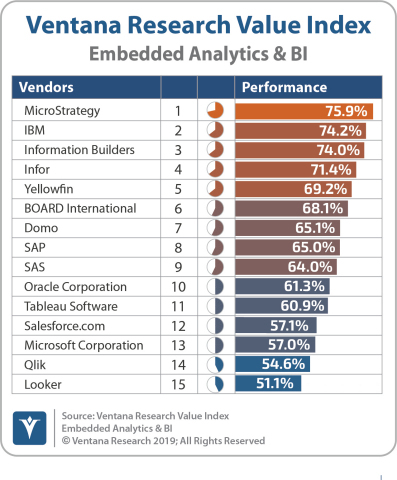 18, 2019-- MicroStrategy® Incorporated (Nasdaq: MSTR), a leading worldwide provider of enterprise analytics and mobility software, today announced that it has been ranked the #1 overall leader in the latest Ventana Research report, 2019 Overall Value Index for Embedded Analytics and Business Intelligence. This week at the Gartner Data & Analytics Summit, MicroStrategy will showcase MicroStrategy 2019, the industry’s first and only enterprise platform for Federated Analytics, Transformational Mobility, and HyperIntelligence™, and demonstrate how organizations can use the platform to build and deploy transformational applications that optimize the value of information and accelerate business results.